This whole not wanting to officially recognize the Droid 2 Global thing is starting to get silly. 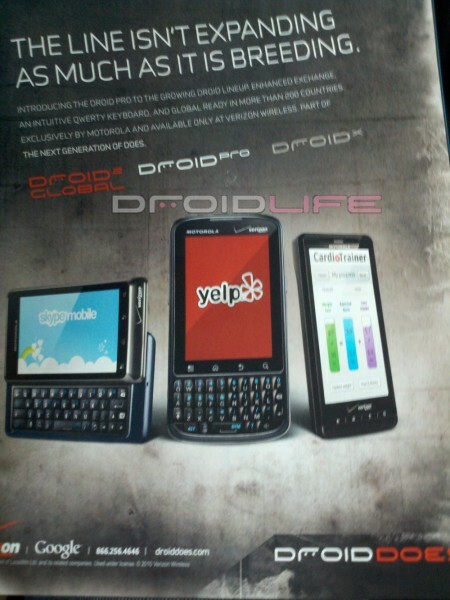 In this new ad which I just pulled from this month’s Details, Verizon introduces the Droid Pro (our review) to the family as the new global beast, only the D2G is also pictured without a mention Now, I think we all understand that they made a mistake by launching the original Droid 2 and are trying not to piss off the massive amounts of people that bought it just 3 months ago, but this phone could be a huge hit with its global capabilities and powerful 1.2GHz processor. Not to mention that the keyboard crushes the OG’s and the OGD2’s…weirdos. Oh, the Droid X is also featured. Nice to see the big dog still holding his own after 5 months of life in the wild. That’s also our third Droid appearance in one day. Here and here.